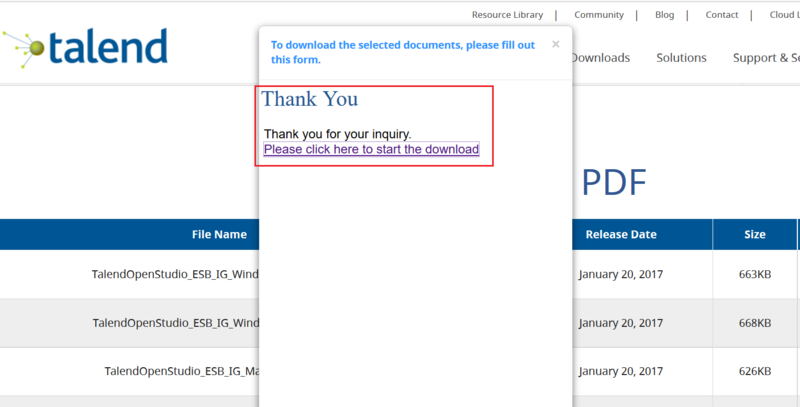 I try to download the user guide FR for Talend ESB. With Chrome, I submit the form and the "please wait" message never ends. With IE, the form is OK but I never receive the email with the link. ( I tried with my pro email and gmail, US/Europe). Please how can I download theses docs ? The online doc is not user friendly. Did you download user manuals PDF from talend official website:https://www.talend.com/download/talend-open-studio/? Have you tried to use FireFox browser to see if it is Ok with you?